For more information about the Zbot/Zeus malware, check out this article. For more info about the Zeus P2P Gameover malware, read this article. SpyEye is a data-stealing malware (similar to Zeus) created to steal money from online bank accounts. This malicious software is capable of stealing bank account credentials, social security numbers and financial information that could be used to empty bank accounts. This banking Trojan contains a keylogger that tries to retrieve login credentials for online bank account. The attack toolkit is popular among cybercriminals because it can be customized to attack specific institutions or target certain financial data. SpyEye is able to start a financial transaction as soon as a targeted user initiates an online operation from his bank account. For more information about the SpyEye malware, check this article. Ice IX, the modified version of Zeus, improved a few Zeus capabilities. The most important one is a defense mechanism to evade tracker sites, which monitor at present most Command and Control servers controlled by Zeus. To find more information about the Ice IX malware, this article is a good resource. For cybercriminals, it is an advanced toolkit which they can use to trick users into revealing confidential information and steal banking credentials. The stolen credentials are then used by cybercriminals into accessing online accounts and running fraudulent transactions. For more information about the Citadel malware, see this article. And, if you want, you can also read about its successor, Atmos, which emerged in the first half of 2016. Distributed through the typical methods of using malicious e-mail attachments, drive-by downloads or by clicking on a deceptive pop-up window, what is different at this financial malware is the high number of legitimate web resources used to collect information and potentially make fraudulent transactions. It is indicated that cybercriminals have deployed botnets on over 25,000 infected machines. To learn more about the Carperb malware, this is a good resource. The collected information is sent to the cybercriminal’s remote server. Cybercriminals spreads the malware mostly by inserting malicious links in the e-mails they send to the targeted users. When a user clicks a malicious link, he is directed to a dangerous website where the Bugat executable downloads on the system. For more information about the Bugat malware, check out this article. Similar to Zeus Gameover, this malware makes use of a (DGA) Domain generation algorithm which is used to generate a number of domain names that can be used receive commands between the malicious servers and the infected systems. The Trojan is delivered mostly through drive-by downloads on compromised websites and via malvertising, where malicious code is inserted in adverts that are then placed on legitimate websites. For more information about the Shylock malware, you can use this resource. For more information about the Torpig malware, you can read this article. How do I stay safe from CryptoLocker? Install a specialized security solution, such as Heimdal PRO. Be careful at the e-mails you receive and don’t download or run e-mail attachments from unknown e-mail senders. Also, don’t click the links in these types of e-mails. Back up your important documents and files. Create backup copies of your data in multiple locations. And there’s more advice in our protection guide against ransomware. 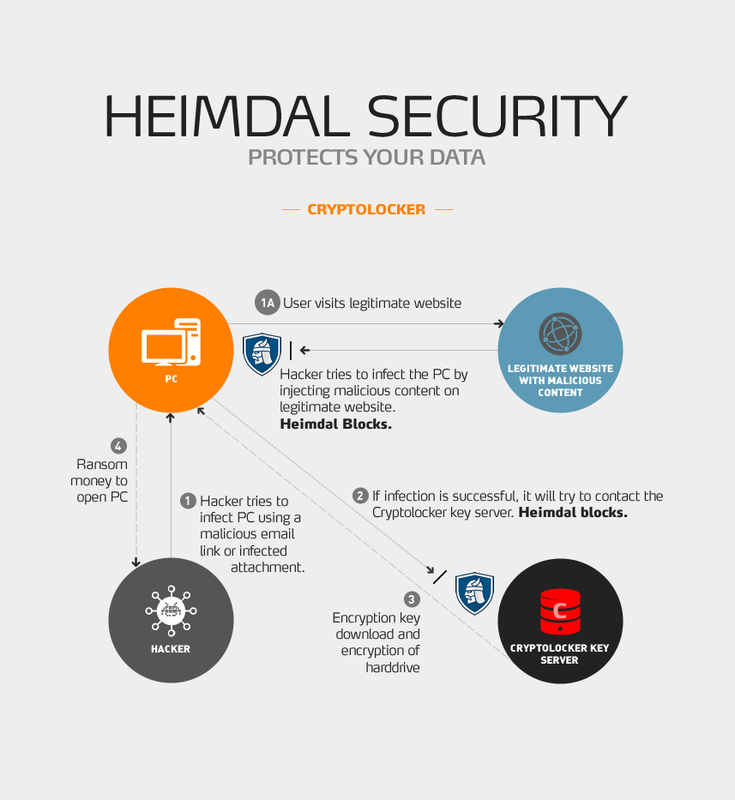 How can Heimdal protect me from CryptoLocker? Heimdal blocks malicious websites which distribute CryptoLocker by making sure that users do not establish untrusted connections. Heimdal can shield a PC from an attacker’s domain and it can prevent CryptoLocker from downloading its encryption keys, even if a PC has already been infected. An example on how Heimdal protects users from financially exploiting malware, such as Cryptolocker, can be seen below. 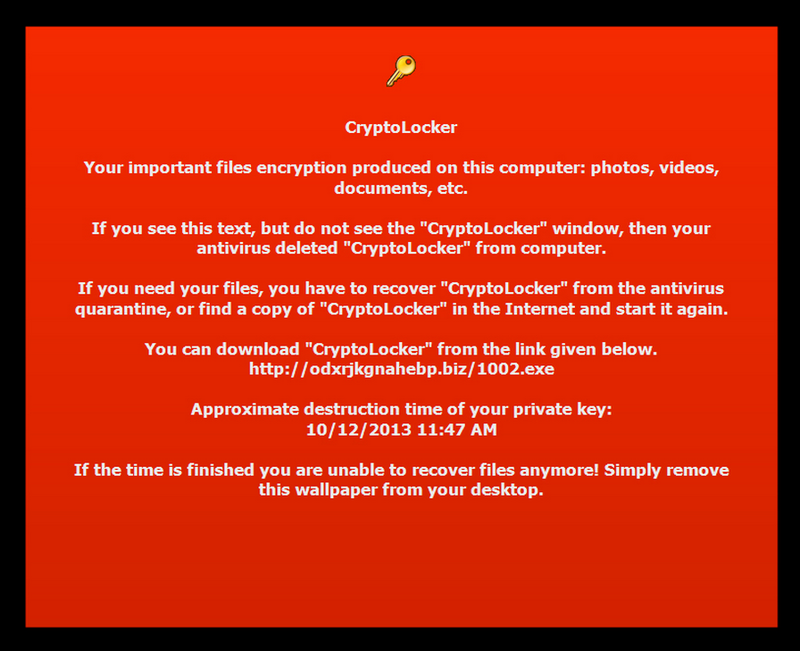 For more information about Cryptolocker, read this article. 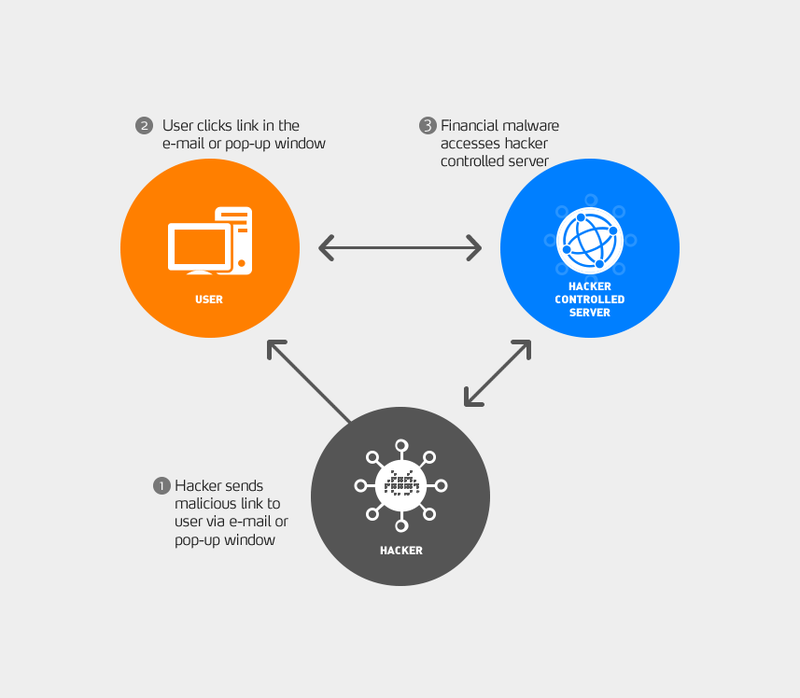 What is the typical spreading method for financial malware? The user receives an e-mail message from a well-known organization with some false banking information attached or with a link included in the e-mail. The system becomes infected when the user clicks the link or downloads the file attached to the e-mail, usually disguised as an important invoice or job offer. A drive-by download occurs when the user visits a website or clicks a deceptive pop-up window. What does a typical financial attack look like? The user accesses his online banking account. The domain is specified in the configuration file downloaded by the malware from the malicious servers controlled by the hackers. 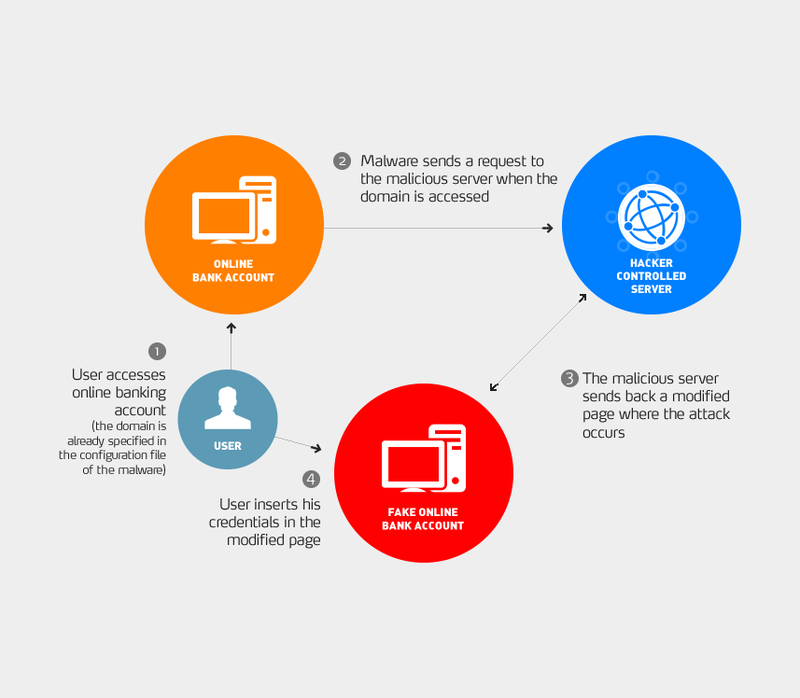 The malware sends a request to the malicious servers controlled by cybercriminals and lets them know the user is trying to access the domain specified in the configuration file. The malicious server specifies a page on the online banking account – usually the login page – where the attack should occur. When the user accesses the specified page, the malware sends a request to the malicious server which sends back a modified page into the user’s browser. The modified page should trick the user into believing he enters his credentials in the normal page of the online banking account. The modified page (the login page in our case) asks for user’s sensitive information, such as credentials for online banking website or the credit card number. This is just a typical phishing attack used by IT criminals, but their means and tools vary from stealing the credentials through the classical method of using a keylogger software, to withdrawing money directly from the online banking account. To make sure your system is protected from financial malware, follow these steps and make sure you are using a specialized security solution against data-stealing malware, like Heimdal PRO. This post was originally published by Aurelian Neagu in August 2014. It was updated by Andra Zaharia in April 2016. Protect Your Online Accounts and Other Personal data from spammers. There is a lot of malware that is available on the society and some of are so dangerous that they can easily infect your system and will totally breaks the internal system. Very Nice Information thanks for Sharing.. There is a lot of malware that is available on the society and some of are so dangerous that they can easily infect your system and will totally breaks the internal system. So, my suggestion is to install an antivirus on your system to secure your system. Bank account needs to be protected. Because in now days banks are not save.